The Cash for Clunkers bill, a.k.a. the CARS program, is now active. If you're interested in trading up they've released the rules, all 136 pages of them, which we summarize for you below. After you turn your car in, all the valuable parts will be sold off except the engine, which will be destroyed so it doesn't end up in an old Volvo. The only major change from the previous summaries of the bill is the removal of a "voucher" system for getting a new vehicle. There are no vouchers. You'll instead get a credit for the car, just like with any other discount. For the full rules, you can download the PDF here. Or you can just check out the details in the chart above and summary below. * Have a combined fuel economy of 18 mpg or less. 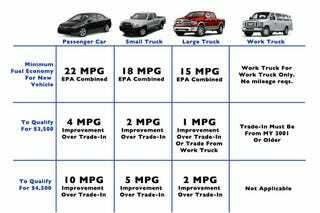 New Vehicles (divided in to 4 categories) - The mpg values are EPA combined city/highway fuel economy as posted on the window sticker of the new vehicle. Passenger Cars: New passenger cars with mileage of at least 22 mpg are eligible for discounts. If the mileage of the new car is at least 4 mpg higher than the old vehicle, the discount will be worth $3,500. If the mileage of the new car is at least 10 mpg higher than the old vehicle, the discount will be worth $4,500. Light-Duty Trucks: New light trucks or SUVs with mileage of at least 18 mpg are eligible for discounts. If the mileage of the new truck or SUV is at least 2 mpg higher than the old truck, the discount will be worth $3,500. If the mileage of the new truck or SUV is at least 5 mpg higher than the old truck, the discount will be worth $4,500. Large Light-Duty Trucks: New large trucks (pick-up trucks and vans weighing between 6,000 and 8,500 pounds) with mileage of at least 15 mpg are eligible for discounts. If the mileage of the new truck is at least 1 mpg higher than the old truck, the discount will be worth $3,500. If the mileage of the new truck is at least 2 mpg higher than the old truck, the discount will be worth $4,500. Work Trucks: Consumers can trade in a pre-2002 work truck (defined as a pick-up truck or cargo van weighing from 8,500-10,000 pounds) and receive a discount worth $3,500 for a new work truck in the same or smaller weight class. Dicounts are limited to 7.5 percent of total funds. There are no EPA mileage measures for these trucks; however, because newer models are cleaner than older models, the age requirement ensures that the trade will improve environmental quality. Consumers can also "trade down," receiving a $3,500 voucher for trading in an older work truck and purchasing a smaller light-duty truck weighing from 6,000 – 8,500 pounds.